Borsch is another thing I picked up from my Ukrainian grand grandma apart from potato zrazy, vareniki with mashed potatoes, lazy cottage cheese vareniki and kovrizhka. The summer version of it (which is also my favorite) is made of just vegetables: beetroot, carrots, onions, tomatoes, potatoes and cabbage. Though it had beetroot in most of the red color still comes from tomatoes. They are essential in our borsch also for their flavor and sourness. During the colder times, when we need to make it more substantial we add mushrooms or red kidney beans. 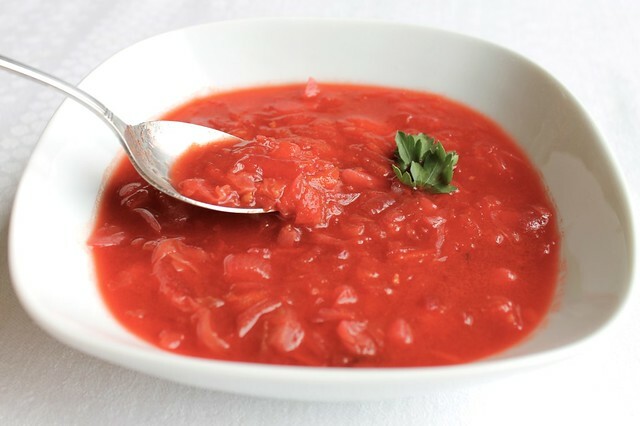 Long ago we noticed that borsch tends to rise in flavor with the time it rests after cooking. If you taste it when it is just done it appears almost bland. If you let it stand still under lid for some 20 minutes it becomes absolutely irresistible. However it is even better the next day after cooking. It is a great comfort food, very light and very satisfying at the same time. Traditionally it is eaten hot, often with sour cream (though I prefer it on its own). In the summer we also eat it cold quite often. It tastes just lovely and does a great job at cooling you down when it is hot outside. Making it is nothing at all complicated. Heat the oil in a large pan. Add the onion and cook on medium heat stirring till it gets translucent. Add the carrots and beet, sprinkle with salt and sugar and sautee under lid for 10-15 minutes till the vegetables are soft, stirring occasionally. Sprinkle the flour over the vegetables and stir. Add the tomatoes and tomato paste and cook stirring for 5 more minutes till the vegetables almost turn into a rough paste. Set aside. Place the potatoes in a large saucepan. Add 1 liter of water and bring to the boil. Cook for 10 minutes. Add the cabbage to the pan with potatoes, bring back to boil and cook for 5 more minutes. Add the sauteed vegetables to potatoes and cabbage. Add more water if the soup is too thick and bring back to boil. Cook for 10 more minutes, take off the heat and let stand under lid for at least 10 minutes (better 20 minutes). Taste and add salt and sugar if needed. Serve hot or cold on its own or with sour cream. The flavor becomes even more intense the next day. А почему ваш борщ украинский? На этот рецепт вправе претендовать русские, казаки (донские и кубанские), евреи etc.